Studenica Monastery is one of the largest and richest Serb Orthodox monasteries. The monastery is best known for its collection of 13th- and 14th century Byzantine-style fresco painting. It's a representative example of the typical Rascian archictectural style, which has a mix of Romanesque and Byzantine elements. It was founded in 1183 by Stefan Nemanja - founder of the medieval Serb state. Its fortified walls encompass three churches: the Church of the Virgin and the Church of the King, both of which were built using white marble, and the smaller and simpler Church of St. Nicholas. 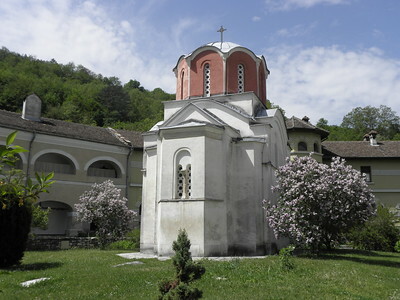 The monastery was the cultural and spiritual centre of the mediaeval Serbia. It produced the Studenica Typicon, the first book of literature in Serbian. Despite its prominent place in Serbian history, the Studenica Monastery nowadays is a simple and quiet place. I drove there from Vrnjacka Banja (a spa town near Kraljevo), stopping on my way at the rather grand Zica Monastery. Well, at least they have a car park that is made for hundreds of visitors. And its bright red colour (after Mount Athos) draws the attention from afar. None of that awaits at Studenica. It's a little more remote, uphill on a winding road through the pretty mountains that also are a Unesco Biosphere Reserve. I ended up at the backside of the monastery, where I took the last parking spot among 8 or so. 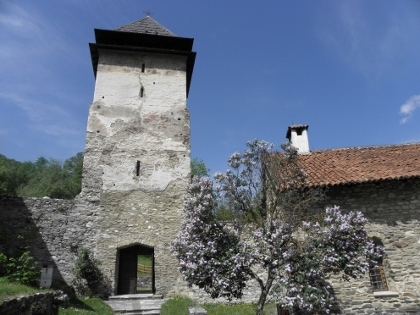 The monastery is fully surrounded by a stone wall, including a tower and two gates. The inner area of the monastic complex is quite small. Around the edges lie the rooms that are in use by the current monks - this is an active monastery. 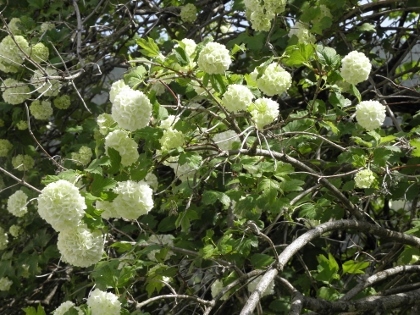 I visited on Sunday May 5th, which happened to be Easter Sunday in the Julian Calendar which is used by the Serbian-Orthodox Church. The Serbian visitors were dressed in their Sunday best, and two families had their little baby baptized in the Church of the King by a bearded priest clothed in black. The larger church (Church of the Virgin) has a pretty typical Rascian design, a mix of white marble and a romanesque front combined with Byzantine murals inside. Unfortunately photography is not allowed inside, so I cannot show what it looks like. The paintings featuring mainly blue and gold colours cover most of the walls. The state of repair varies - the site does look if it could use some extra money. No entrance fee is asked though. What struck me most about this visit is the monastery's quietude and pleasant atmosphere. The areas between the churches are filled with flowering trees, great to smell and a real attraction to large amounts of endless zooming bees. I sat on a bench in the garden for a while, just to enjoy it all. Yes i have been to the Studenica monastery in Serbia. I Slept there because i needed to stop off somewhere while i was going to Kapponik. It is a magnificent site and its is so bueatiful. Studenica Monastery is a huge complex including several churches, being the main one dedicated to the Presentation of the Holy Virgin. 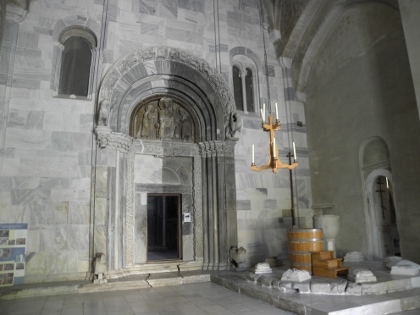 Besides this one there is another church dedicated to Saints Joachim and Anne, a small church dedicated to Saint Nicholas with beautiful frescoes inside and the foundations of another church dedicated to Saint John the Baptist. In order to get the Monastery you should leave from Belgrade heading for the town of Nis and taking a secondary road that is crossing the towns of Kragujevac and Kraljevo. In a short distance from Studenica there are some other monasteries such as Zica and Sopocani, being this last one a World Heritage Site as well. If you are fond of orthodox churches, as for sure I am, this is definitely a place that you will enjoy.